The solution to remove the OneDrive folder from the Microsoft File Explorer in Windows-10, this example is also for Windows 8.1, 7 and Servers suitable! 1.) ... OneDrive in Windows-10 MS File Explorer! 2.) ... Enable / Disable the OneDrive Folder in Windows 10! 3.) 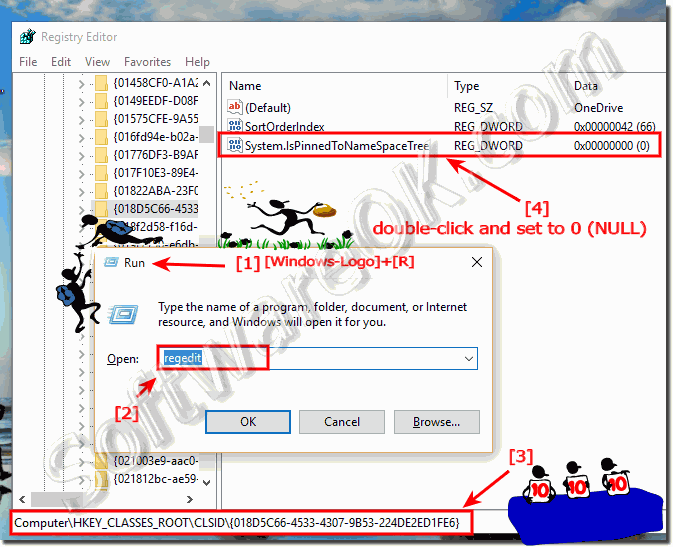 ... Windows 10 File Explorer without OneDrive Folder! 1.) OneDrive in Windows-10 MS File Explorer! If you're the one who needs OneDrive, here's a screenshot of what it looks like when OneDrive is properly enabled in File Explorer and appears correctly on Windows 10! (Image-1) Show the OneDrive folder in File Explorer! 2.) Enable / Disable the OneDrive Folder in Windows 10! Please start the Registry Editor, for example via Windows-Logo+R Keyboard-Shortcut and the command regedit. please do a left mouse double click on System.IsPinnedToNameSpaceTree and set the value from 1 to 0 (NULL). Info: To restore OneDrive in MS-Explorer set the value from 0 to 1. (Image-2) Remove the OneDrive folder from File Explorer! 3.) Windows 10 File Explorer without OneDrive Folder! If you're the one who likes to work without OneDrive, here's a screenshot. when OneDrive is removed from File Explorer ergo disabled! If you decide to activate OneDrive, repeat the curtain and change the System IsPinnedToNameSpaceTree value from 0 (NULL) to 1 (ONE). as described under point-2 here in the FAQ. 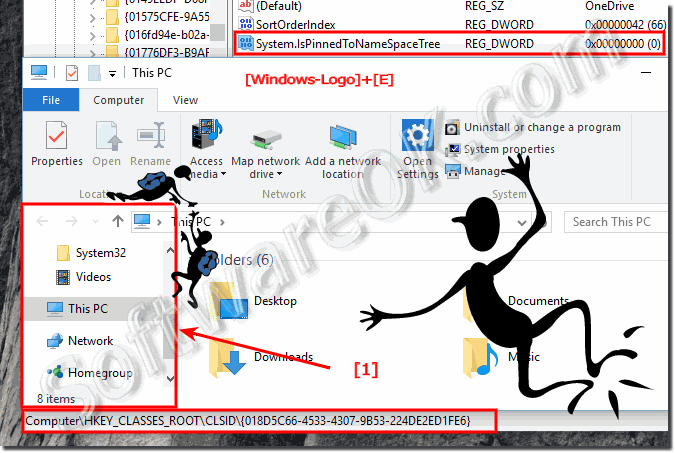 (Image-3) Windows-10 Explorer without OneDrive ! Remove the OneDrive folder from File Explorer is suitable for: Windows 10 (Redstone 4 & 5) Pro, Enterprise, Home, Windows 8.1, Windows 8, Windows-Server 2016, 2012, 2008, Windows 7 Basic, Professional, Starter, Ultimate Who does not need OneDrive, wonders how to remove it and someone needs the OneDrive, but it is missing in File Explorer, of course, OneDrive wants to activate, under Windows, it is no different, the solution is simple! Windows-10 - FAQ-141: How to remove the OneDrive folder from File Explorer in Windows-10? Remove onedrive from file explorer? Disable onedrive from explorer dropdown menu? How to remove thet one drive folder? How to add one drive to file exporer windows 7?